Surviving the first year of law school is hard enough before you add commuting to Great Lakes military base, doing drills, watching recorded lectures, and getting exams rescheduled due to conflicts with military orders. But that was life for naval reservist Davion Chism (JD-MBA ’18) as she embarked on her degree at Northwestern Pritzker School of Law. To navigate the chaos, Chism drew inspiration where she could. In her case, it was Professor Bruce Markell’s Contracts class. 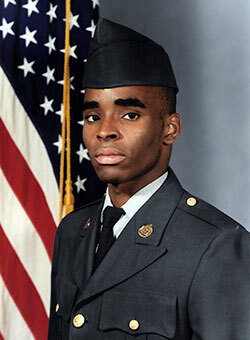 Kendrick Washington II (JD ’10) during basic training at Fort Knox, Kentucky, in 1995. Veterans in the Northwestern Law community see a legal career as a natural path after service to the nation. “People in the service feel a little constrained sometimes. The law is a great place to be free from those constraints and creatively put together solutions,” says Kendrick Washington II (JD ’10), who enrolled in Northwestern Law at 32 after several years serving as chief of media relations for the Army in Hawaii. Today, Washington is an adjunct professor at the Law School, teaching Children in Conflict with the Law, and a civil rights attorney for the U.S. Department of Education. “People who are committed to the service of others are, in my opinion, the perfect lawyers,” he says. But the transition from military life to student life, especially at an urban law school with a vocal student body, can be difficult. Fortunately, service people at Northwestern Law have support. Botero leaned on the Veterans Law Association (VLA) while she adjusted to life as a civilian in a major city like Chicago. “I moved to America [from Colombia] and joined the military right after [in 2009], so [law school] was a culture shock. In the military we’re stationed in very small cities.” In the VLA, she found other veterans who helped maintain a semblance of the nearly familial support system she had in the Air Force — veterans who helped her feel less like a fish out of water. “The military is a very conservative environment and law school is a very progressive environment,” which she says was another cultural shift. While she appreciated new perspectives, in the VLA she could comfortably speak with other students whose viewpoints were more like her own. 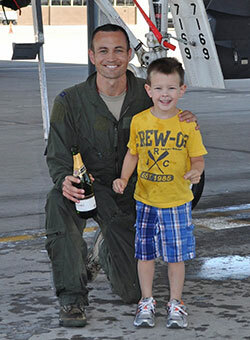 Craig Sanders (JD ’17) with his son, Craig Sanders III, at Mountain Home Air Force Base, Idaho, in 2014. 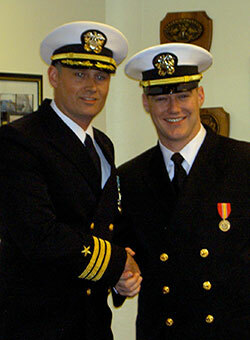 Jason Moehlmann (JD '17), right, with Commander Randy Yaden, after being sworn in as an officer in 2008. Jose Basabe (JD ’20) started law school in 2017 after 15 years of active duty as an Air Force intelligence officer. As the VLA’s current president, he wants to improve the group’s connection to the wider Chicago-area community by providing legal assistance to veterans in need, such as “green card veterans” who are in danger of deportation. “We can’t let things happen where someone who served our country is treated as a stranger,” Basabe says. One of the VLA’s priorities is to make sure Northwestern Law is known as a veteran-friendly school, ensuring, for instance, that VLA members accompany prospective military students who visit campus. “Going back to the Vietnam era, there was a lot of tension between activists and military. That’s hung around in some law schools,” says Moehlmann. While he says this isn’t an issue at Northwestern Law, he adds that the VLA’s mission is to illustrate that “our job was going and fighting wars, but we’re still people.” The VLA, which is open to civilians as well as veterans, hosts social events like monthly happy hours and organizes larger events, like panels featuring JAG scholars to talk about veterans’ issues and the law. He is grateful that, in turn, he is in a position to give back to the military community. “Latham partners with the National Veterans Legal Service Project and does a lot of pro bono work helping vets get access to medical care through the VA and representing veterans with disabilities who think they were mistreated by the VA or by their branch of service,” he says, adding that firms with veteran associates are better equipped to counsel clients who may suffer from PTSD.